An escorted tour of Australia and New Zealand is one of three enticing long-haul itineraries that Ffestiniog Travel will be running in 2019. You can also join them on a tour to Japan and India. Having explored the Great Railways of the UK, United States, Europe and India in his popular BBC series, Michael Portillo has turned his attention Down Under for his latest train adventure. Spotted filming ‘Great Australian Railway Journeys’ in the Southern Hemisphere earlier this year, fans of the programme and rail travel aficionados alike await confirmation of the series’ broadcast date with eager anticipation. Keen to explore this fascinating continent for yourself? Rail holiday specialist Ffestiniog Travel has now opened bookings on its Antipodean Tour. Journeying across Australia and New Zealand through spectacular landscapes on some of the world’s most famous and iconic trains, this 23-day itinerary also weaves in time to explore the vibrant Asian cities of Singapore and Hong Kong (on the outbound and return legs, respectively). Follow in Michael Portillo’s tracks on board the legendary Ghan train, travelling an epic 2,979km in Gold Class across Australia’s Red Centre from Darwin to Adelaide, and enjoy a day on the legendary Puffing Billy Steam Railway as it makes its way from Belgrave through the natural splendour of the Dandenong Ranges to Gembrook, as well as enjoying epic sightseeing in Darwin, Alice Springs, Adelaide, Melbourne and Sydney. In New Zealand, the unforgettable experiences continue. 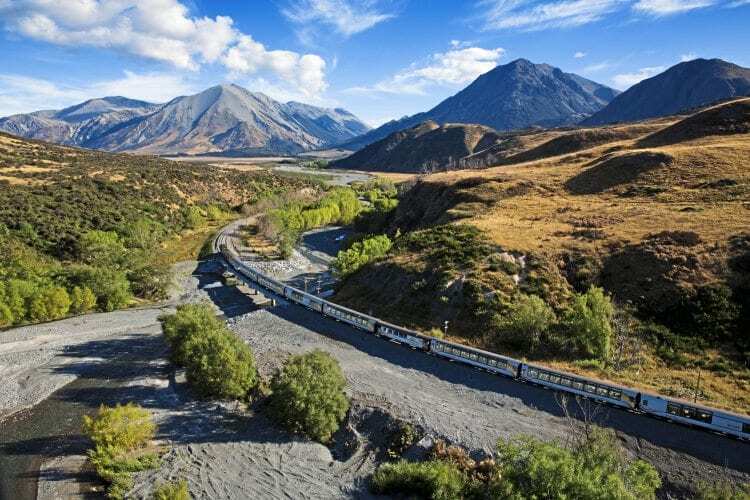 Take the ‘Northern Explorer’ train through the UNESCO-listed Tongariru National Park to Wellington, and revel in one of the world’s most scenic railway journeys – the TranzAlpine (see picture above) – amid the South Island’s stunning mountains and vast Canterbury Plains. While in The Land of the Long White Cloud, Ffestiniog Travel clients will also spend a day sailing from the North to the South Island on the Interislander ferry, a route renowned for its breath-taking views, and on the equally impressive Coastal Pacific train. There will also be ample time to explore Auckland and Christchurch, as well as take excursions to the famous geysers at Rotorua and Waitomo Glowworm Caves. Departing February 9, 2019, the ‘Antipodean Tour’ costs from £6,300pp (two sharing), including flights (London), B&B, all rail journeys, tickets and excursions as per the itinerary, and the services of a tour leader from London and throughout the tour. This comprehensive 19-day itinerary, timed to coincide with Japan’s famous Cherry Blossom season, combines railways, tram networks and destinations not previously visited on Ffestiniog Travel tours to the Land of the Rising Sun. Take a scenic rail journey along the Shonan Coast, travel by steam on the Tobu Railway and explore the tram routes of Tokyo, Toyama, Takaoka, Fukui and Osaka. 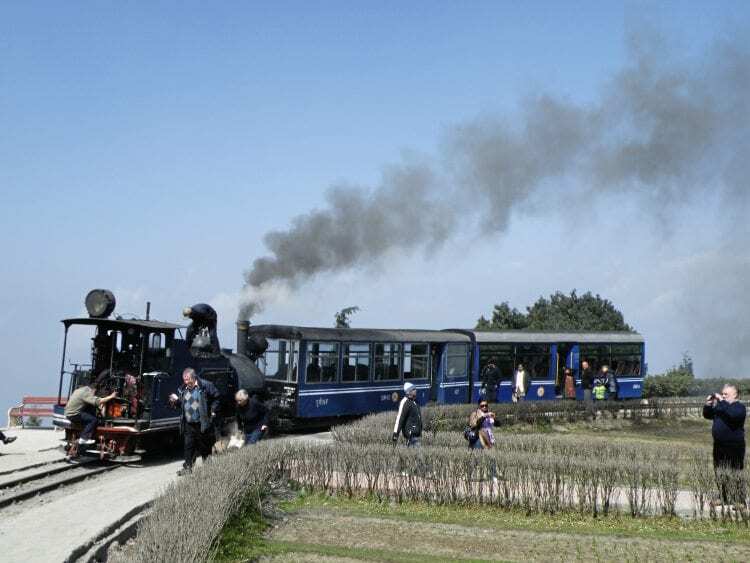 One of the highlights of this tour is a journey on a steam locomotive known as Taiju that will power travellers on a 12km journey to Kinugawa Onsen. 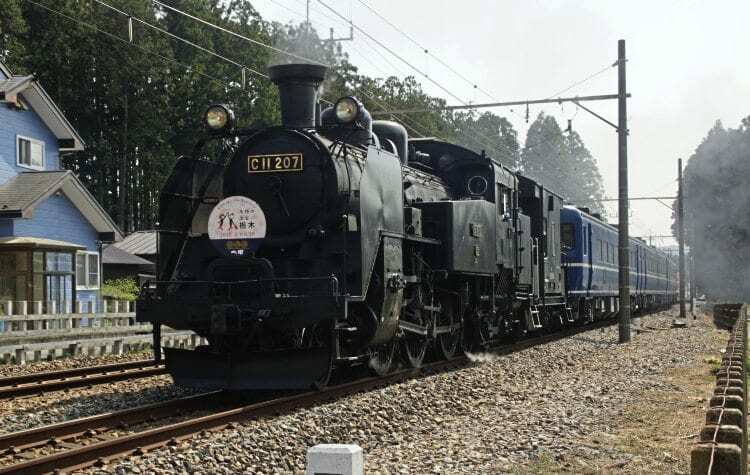 This Tobu Railway steam service was only reinstated on this line in August 2017 after a 50-year hiatus. The C11-type loco (see picture below) will haul the train to Kinugawa Onsen, a hot springs resort along the Kinugawa River, and home to one of the most famous hot springs in Japan. Travellers then get to overnight in a traditional Japanese Onsen. Spend one morning exploring the temples and shrines of the historic, UNESCO-listed city of Nikko – including the iconic Toshogu Shrine and red-lacquered, sacred Shinkyo Bridge, enjoy unforgettable views at Amanohashidate (the famous pine-covered sandbar spanning the mouth of Miyazu Bay), and hop on an internal flight to Okinawa for an exploration of the island’s fascinating historic sites and scenic spots. Departing March 19, 2019, ‘Japan – Trains, Trams & Cherry Blossom’ costs from £4,995pp (two sharing), including flights (London), seven-day first class Japan Pass, Kansai Thru Pass for the Osaka area, B&B, three dinners, all rail journeys, tickets and excursions as per the itinerary, and the services of a tour leader from London and throughout the tour, as well as a local guide in Japan. Encompassing several of the train experiences enjoyed by Michael Portillo in his last TV travelogue – Great Indian Railway Journeys – this tour ticks off the three exceptional railways that served the former British hill stations (the Kalka Shimla Railway, the Darjeeling Himalayan Railway and the Nilgiri Rack Railway). Expect engineering excellence, fierce gradients and stunning scenery on this 21-day holiday, which promises rail enthusiasts the opportunity to travel by private carriage between Kalka and Shimla, by private steam charter between Shimla and Shoghi, two days of private steam charters on the Darjeeling Himalayan Railway (DHR), and to ride on the ‘Joy Train’ to Ghum. As well as visits to railway museums and workshops, there are myriad sightseeing opportunities to enjoy, including the Taj Mahal and Red Fort at Agra, the fascinating Atari-Wagah Frontier, the Golden Temple at Amritsar, New Delhi’s India Gate, the Blue Mountains and the Mudamalai Wildlife Sanctuary in Nilgiri, home to several endangered species such as Indian elephants, Bengal tigers, Gaur and the Indian leopard. Departing February 17, 2019, ‘Indian Hill Railways’ costs from £5,150pp (two sharing), including flights (London), B&B, 16 lunches, 12 dinners, all rail journeys, tickets and excursions as per the itinerary, and the services of a tour leader from London and throughout the tour. For more information on Ffestiniog Travel’s tailor-made rail holidays, ticket-only service and escorted tours worldwide, call 01766 512 400, email info@ffestiniogtravel.co.uk or visit www.ffestiniogtravel.com. It has never been so easy to book with Ffestiniog Travel. All of its escorted tours can now be booked online via the website www.ffestiniogtravel.com at the touch of a button.